Our teachers spend much time daily, giving Health messages and discussing skills and strategies for children to build their personal and social competencies. Personal competencies are the self-management skills including emotional intelligence, self-esteem and positive ways of thinking for success. Social competencies are to do with inter-personal skills including team building, leadership, negotiation, compromise, assertiveness and being a friend. Children learn better when armed with a large toolkit of skills. We use the ‘You Can Do It’ keys for success and ‘Kelso’s Choices’ to support this learning. Lessons are given to explicitly teach the above and also to address health matters to do with looking after the body: safety, nutrition, hygiene, biology and community health issues. It is mandated that children have 120 minutes of structured physical activity per week. The total time for Physical Education classes is 60 minutes, provided by the Physical Education teacher, Pam Algar, with an additional Senior/Junior Sport session each week. Fitness sessions range from 10 minutes to 30 minutes on most days, where there is no Physical Education or Sport. Glengarry teachers are aware of the benefits of movement for children and endeavour to include movement within and between other lessons. Pre-Primary and Year 1 - focus on the fundamental movement skills. A Perceptual Motor Program runs once a week for Pre-primary children and depends upon parent/grandparent/guardian help. Years 2, 3 and 4 - ‘Fundamental movement’ skills are extended to specialized skills with minor/modified games and other physical activities. Years 5 and 6 are given opportunities to demonstrate a range of strategies in modified games, sports and physical activities. These year groups participate in inter-school competitions covering athletics, swimming and winter sports. 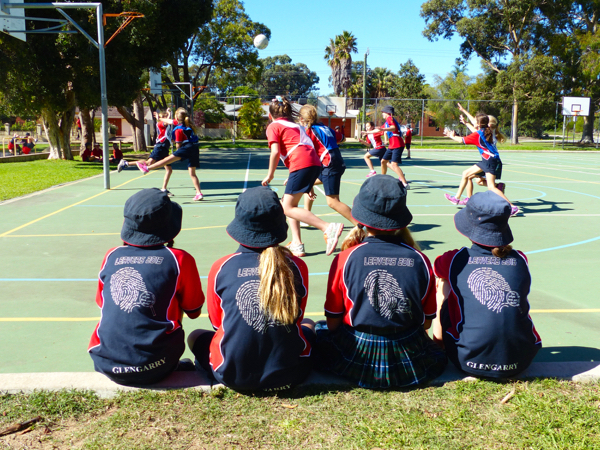 All year groups participate in the House Athletics Carnival, Years 1 to 6 in the Cross-Country Run and Years 4,5 and 6 the House Swimming Carnival. Swimming lessons are run for pre-primary children to Year 5, with swimming lessons taken at the beach in Year 6. Another opportunity for children to learn physically and emotionally is through the House Activities. Activities allow children to spend time with buddies and provide real chances to feel part of the whole school. As Physical and Health Education are closely linked, the educative side of lessons teaches children how to manage themselves and interact with others, whilst games are a great way of practicing these skills. The curriculum is still evolving and we are adapting to prepare each of our children for a healthy future. For regular updates and information please visit Ms Algar's blog page.